we wanted, but didn't exist." Until now. It's cross-platform, built on PHP and CSS, and designed work with any model and any quantity of Hyperdecks. Use it for any of your personal or commercial projects! All essential transport controls are available within each deck's interface row, including looping play by clip or all clips. Easy to spot visualization of a decks current transport state. Gang any combination of decks. Convienient Sync interface allows full transport control of all included decks. Schedule a basic transport control function in advance. Set up an event per deck or even decks included in the Sync. Add or remove events easily. View a deck's list of clips and cue by selection. With cue & play enabled, selecting a clip instantly cues and begins rolling. Use the Clip Bin to download clips from the HyperDeck Mini. Use your personal or comany avatar or logo. Enable authentication to keep your control secure. Record clips with a custom file name structure. Change your decks recording format, audio source, slot, and input. Format your media for a fresh start. Export settings to easily switch from gig to gig. Automate with our simple API. Cross-platform browser control for BlackMagic HyperDecks. Bringing more functionality to your workflow with HyperDeck Panel's expanded feature set. 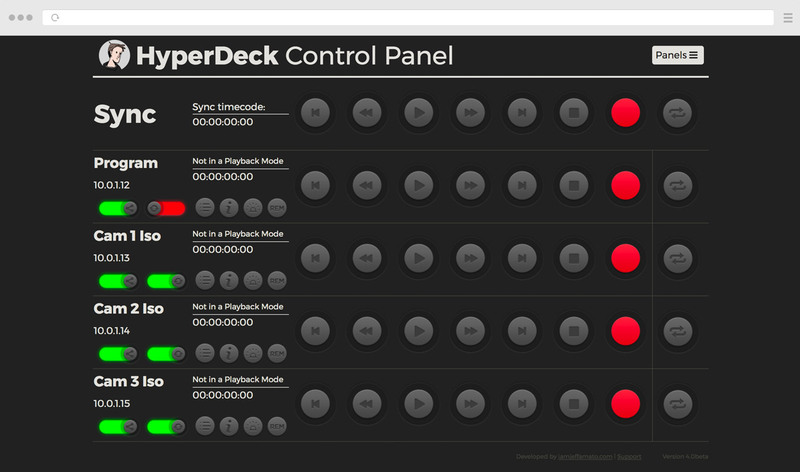 HyperDeck Panel requires a PHP environment to run. 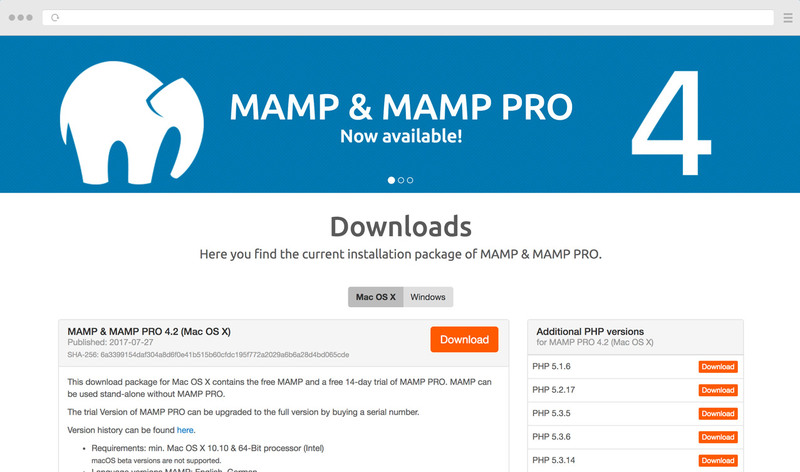 If you are not familiar with configuring a server, we reccomend using MAMP. It comes in two flavors, Windows and Mac, and the non-pro version is free. HyperDeck Panel relies on a server-side coding language called PHP. There are numerous ways to run HyperDeck Panel like on an existing server, a raspberry pi, or an emulated server on your computer. The easiest way to accomplish this is using an application we recommend called MAMP, which after installed runs a server on your computer. Your computer needs to be on the same network as your HyperDecks in order to communicate with them. It is a good idea to assign them static addresses on your network. Alternately, you can use an existing server, raspberry pi, or your preferred method. The default root folder for MAMP is:HardDrive > Applications > MAMP > htdocs or C:\MAMP\htdocs\. Now HDP can be accessed in your browser at http://(MAMP computer's ip):8888 which would look something like http://192.168.1.23:8888. If you would like to change the default port from 8888 to 80 you can do so in MAMP's preferences. Doing this allows you to only have to input the ip (or "http://localhost") of the computer running mamp, like so: http://(MAMP computer's ip) which would look something like http://192.161.1.24. To configure HDP, choose the 'Settings' panel from the menu drop down in the top right corner, or by clicking 'Add a deck' on a fresh install. Under the Interface section you can define how many decks you'd like to be able to control. Save your progress, then begin to enter the information into each respective deck's settings box. You can enable authentication by changing 'Login' in the interface settings to 'Enabled'. If the login feature is enabled, there is an array for user names and passwords in _login_users.php. You can use a standard text editor, but we recommend something with syntax recognition like KomodoEdit (Free). You can add as many as you'd like. The default is admin/1234. HDP can have multiple users logged in at the same time. //the username and the second '' after the => being the password. //last one in the list as shown below. Press Close in the Settings Panel or use the menu to navigate back to the Control Panel. That's it. You should be up and running. If you have added a deck and the connection status switch is red, this means HDP could not connect to the HyperDeck. The most common occurance is that the a deck has been configured in the ATEM Software. ATEM connections to HyperDecks are persistent, so for HDP to work the settings in the hyperdeck section of the ATEM Software must be cleared. Otherwise, check your IP config or any firewalls that may be blocking port 9993, this is the tcp port on which the HyperDeck receives commands. By default all decks are not set to sync, simply toggle the decks you'd like to include in the sync function. For an explanation of controls, see the help page located in the menu.